The list of Ghanaian artists to perform at Ebony Reigns’ tribute concert has been announced. Yaa Pono, Ras Kuuku, Sarkodie, Stonebwoy, Samini, VVIP, R2Bees, Ras Kuuku, and Nana Boroo have all been announced for the concert, which is expected to attract several thousands of fans. Other expected performers include Kofi Kinaata, Feli Nuna, Brella, Danny Beatz, and a host of others. 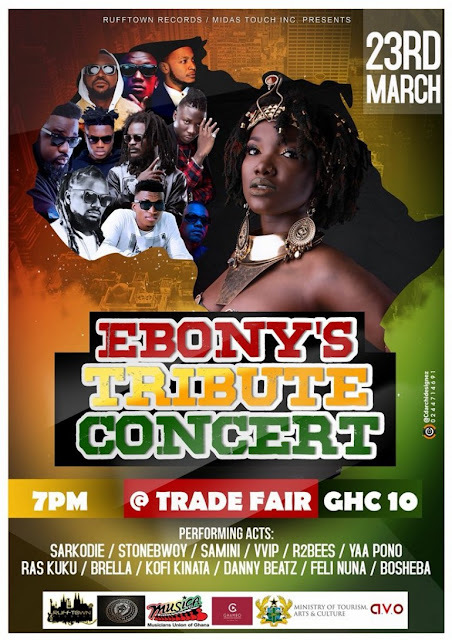 The concert is scheduled to take place at the International Trade Fair Centre in Accra on March 23, to render tribute performances to fallen colleague Ebony Reigns. Rufftown Records/ Midas Touch Inc. is partnering with the Musicians Union of Ghana (MUSIGA), Ghana Music Rights Organisation ( GHAMRO), and the Ministry of Tourism, Arts and Culture. Ebony Reigns her untimely death in a February 8 car crash on the Kumasi – Sunyani road. Her final funeral rights have been slated for Saturday, March 24 at the forecourt of the State House.